Sony's latest desktop effort is one cool example of the experimentation in form factors we're starting to see with Windows 8 hardware. Yes, manufacturers will be shipping stock clamshell laptops and ordinary desktop PCs with ten-point multitouch as an option, and PCWorld will be reviewing many of them as they come out. But if Windows 8 is to be truly successful, products such as Sony's Tap 20 will be key. In putting the Tap 20 through its paces, I started with a little photo editing on its decidedly smallish (at least for an AIO) 20-inch, 1600-by-900-pixel display. It was a constraining experience, compared with the more expansive displays I'm used to working with. Then I unplugged the unit, took it upstairs, laid it flat on my dining-room table, and played Pinball FX 2. Notice the smudges on the Sony system in the photo above. Fingerprints on glass will become a way of life, as it is with normal tablets. As more touch-enabled PCs arrive, accessories such as cleaning cloths will be a hot item for those users who dislike fingerprints. Sony has built its new AIO on mobile PC technology, including the same 1.7GHz Ivy Bridge ultra-low-voltage Core i5-3317U CPU used in many mainstream Ultrabooks, with a Turbo Boost up to 2.6GHz when needed. The system also has 4GB of system memory and uses Intel's own HD 4000 integrated graphics to take care of display chores. Storage tasks fall to a 750GB mobile hard drive with no SSD cache, so the storage performance can be a little poky. No optical drive is built in; either you get your video or audio content via the network, or you attach an external optical drive. Although the 1600-by-900-pixel resolution seems a little low for a 20-inch all-in-one, Sony uses an IPS panel, so the color fidelity and video saturation look pretty good, and viewing angles are generally decent. Sony also built in the same Bravia video-rendering engine it uses in its Bravia HDTVs, so video looks nice—when you can get it to run. The problem with video in this case isn't the hardware but Windows itself, which no longer plays back MPEG-2 content, either DVD or high-definition. Sony should consider bundling some type of MPEG-2 playback tool going forward. WMV high-definition video looks quite attractive on the IPS screen, however, as do high-resolution photos. The Tap 20 offers a robust set of connectivity options, including Bluetooth 4.0, gigabit ethernet, and 802.11n Wi-Fi connectivity. Surprisingly, the system sports only two USB 3.0 ports, though one incorporates sleep-and-charge functionality. Also included is an SD/Memory Stick slot, as well as an audio input and output jack. The system lacks monitor inputs and outputs, however—you won't find HDMI ports, or any other video connectors. The stand is large and U-shaped, mounted to the unit via hinges. You can adjust the tilt, but not the height. The stand can rotate parallel to the system, allowing you to lay the machine completely flat on a tabletop or other surface. To facilitate use in the shared tabletop mode, Sony has built in a 5000 mAh battery, which can run the system for up to 3 hours sans power cord, depending on the brightness setting and use mode. Since the Tap 20 carries an ultra-low-voltage mobile CPU, the performance is somewhat lacking compared with that of other all-in-one PCs. PCWorld is in the process of building the new WorldBench 8 suite for Windows 8 testing, but it isn't quite ready yet. We were able to run PCMark 7, including storage tests, plus startup times. In comparison with previously tested AIO systems running Windows 7, the Tap 20 is seriously deficient in sheer CPU performance: Although you can use the system for video editing or gaming, those activities are most certainly not its strong suit. 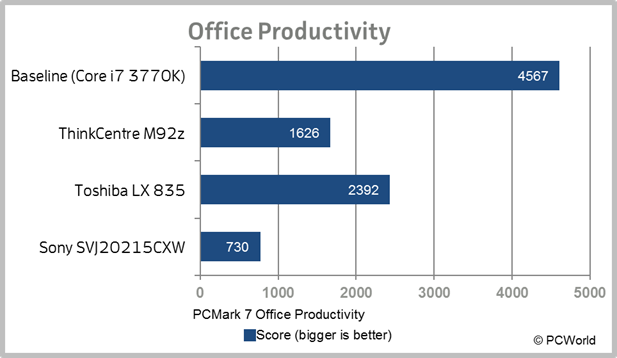 For example, on the office productivity test, the Tap 20 garnered a score of just 730, less than half the mark of Lenovo's ThinkCentre M92z. 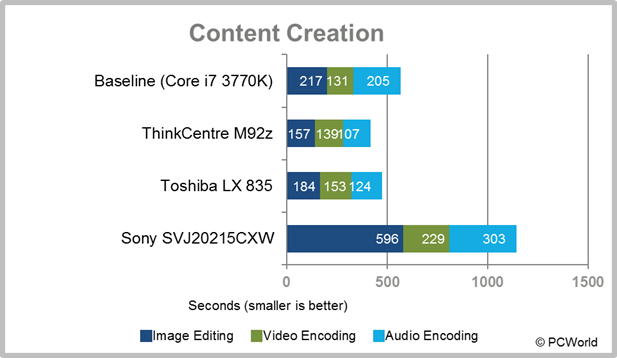 And the Sony's image-editing test took 596 seconds, versus 157 seconds for the Lenovo, in average usage scenarios. Some of the performance issues are attributable to the slow, 5400-rpm laptop-style hard drive. On the other hand, the power usage is low. The idle power of the Sony Tap 20 is just 23 watts, about half the 41W idle power of the Lenovo all-in-one. I set up the Tap 20 in my home office, installing some additional software and getting used to the touch-enabled display. After a time, I discovered that I was using the mouse less, even in the Windows desktop, though some operations in desktop mode were still easier with a mouse. The user interface was responsive and smooth. When I ran Office-style applications, or surfed the Web, both Firefox and Internet Explorer seemed well behaved, even with multiple tabs open. Web-based video playback was mostly clean and stutter-free. Using the system untethered is an interesting experience. At well over 11 pounds and a 20-inch width, this machine is not something you sit on your lap. It does make for a very cool Xbox SmartGlass device. I set it up on my coffee table in front of my entertainment center, within easy reach. Even though SmartGlass is still in its infancy, the technology has the potential to turn a device such as the Tap 20 into a powerful adjunct to your home entertainment setup, if Microsoft keeps enhancing it. I also laid the machine flat and played around with some of the games, like Xbox Taptile and Pinball FX2. These titles show off just a little of the potential of the system as a shared gaming device. Here's hoping that more board-game ports come to the Microsoft Store, as we've seen with iOS games; I'd love to see Ticket to Ride, Elder Sign, or Alien Frontiers on this system. While video quality (what video we could play) turned out well, audio was something of a mixed bag. I discovered that the sound quality varies depending on the surface the system sits on. If it's on a hard desktop, the sound quality is better than if you plop it down on a tabletop covered by a tablecloth. Even in the best case, the sound quality is limited by the speaker size; the unit produces little audible bass content, though Dolby Home Theater v4 spreads out the sound stage a bit without adversely affecting audio quality. If you plan on using the Tap 20 to watch a lot of movies, or as a music playback device, external speakers would be a good idea. The Tap 20 is an unusual product. It's relatively underpowered as a desktop system, but its strong suit is as a shared family PC, with the ability to be moved easily around the home. And its potential as a shared gaming device is impressive. Unfortunately, it isn't as strong on the productivity side, and the lack of MPEG-2 playback—more a Windows 8 problem than Sony's—makes it an imperfect entertainment system. In many ways, the Tap 20 showcases both the good and the bad of Windows 8. Its seamless integration with the Windows 8 user interface shows off Microsoft's new operating system at its best, but the lack of capabilities that users have come to expect, such as MPEG-2 playback, is oddly jarring. When you use this machine with Windows 8 native apps, it excels, but the uninspired keyboard and mouse make desktop use more of a chore than it needs to be. The Tap 20 is undeniably cool, but some of the details need to be fleshed out. Still, at about $880, it's not all that expensive, particularly if you consider that it's both a small all-in-one and a really big tablet. Sony builds a very cool small all-in-one that works well as a shared family PC. The added battery and touch functionality create a unique PC experience.